"Sampath Speaking" - the thoughts of an Insurer from Thiruvallikkeni: Mithila (Madhubani) livery on Train .. .. goes to Japan !! 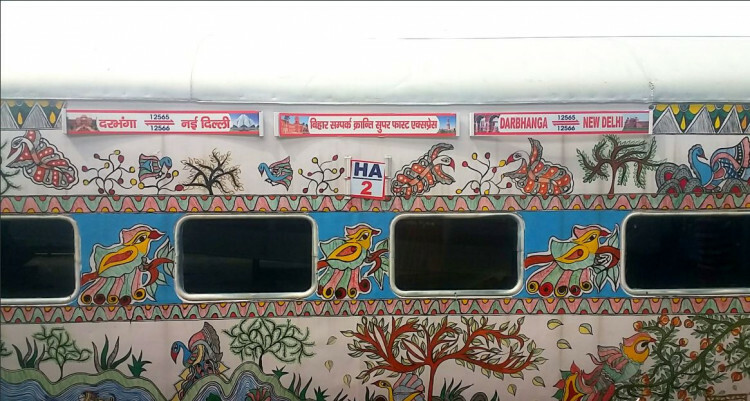 Mithila (Madhubani) livery on Train .. .. goes to Japan !! Travelling in a train is one and enjoying train travel is another – as you travel in a train, what are the aspects that you notice ? Indian Trains have Names besides the Numbers. As you would know, Trains now have 5 digit numbers – earlier they were 4 digits. Many a trains are named after Gods, rivers, important places in the origin or destination – ……. Some are named after personalities and some after traits too.. there are some luxurious trains too……. On August 15, 1977, a train woke up the people as it began its inaugural journey from the temple town of Madurai with 16 yellow and green livery coaches and a matching YDM4 diesel loco. Livery – heard or seen earlier ? Indian Railways has used a large variety of liveries (paint/colour schemes) for its trains, although most of them have been used only for the few special or "prestigious" trains. A dull maroon/rust colour was the overwhelmingly dominant standard for just about all trains except expresses and other special trains. There is also a dark blue paint scheme (with a light blue band about the windows) used almost without exception for all new air-braked stock other than the Rajdhani and Shatabdi coaches. A variant blue livery consisting of dark blue with light blue strips above the windows is also used, mostly for coaches made by RCF. The Kingdom of the Videhas (also Mithila / Tirabhukti) was an ancient Indian kingdom in Late Vedic India which rose to prominence under King Janaka. The ancient kingdom was located on the northern part of the Indian subcontinent, in what is today north-eastern Bihar of India and the eastern Terai of Nepal. Mithila, the cultural region is bounded by the Mahananda River, the holy Ganges, the Gandaki and the foothills of Himalayas. The native language in Mithila is Maithili, and its speakers are referred to as Maithils. The later day Mithila would comprise of Tirhut, Darbhanga, Kosi, Purnia, Munger, Bhagalpur and SanthalPargana divisions[a] of India and some adjoining districts of Nepal. 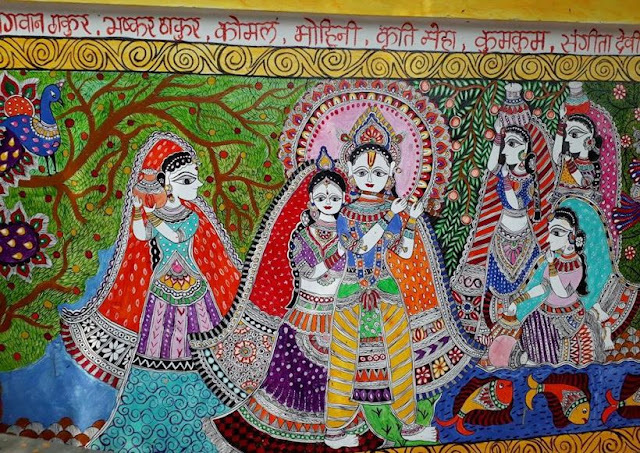 The region is known for its special type of painting ‘mithila or madhubani painting’. The painting was traditionally done on freshly plastered mud walls and floors of huts, but now they are also done on cloth, handmade paper and canvas. Madhubani paintings are made from the paste of powdered rice. Madhubani painting has remained confined to a compact geographical area and the skills have been passed on through centuries, the content and the style have largely remained the same. Madhubani painting has been accorded the coveted GI (Geographical Indication) status also. Madhubani paintings mostly depict the men & its association with nature and the scenes & deity from the ancient epics. Natural objects like the sun, the moon, and religious plants like tulsi are also widely painted, along with scenes from the royal court and social events like weddings. Madhubani art (Mithila painting) racticed in the Mithila region of the Indian subcontinent, is done with fingers, twigs, brushes, nib-pens, and matchsticks, etc. Using natural dyes and pigments, and is characterised by eye-catching geometrical patterns. India’s famous Mithila art grabs Japanese eyeballs! Here is something from an article in Financial Express. Mesmerized by the beauty of India’s Mithila folk paintings, Japan is planning to engrave similar art designs on its trains. Indian Railways move to engrave Mithila paintings on its trains has left a very positive impression on other countries, according to a DainikBhaskar report. Japan has requested the Piyush Goyal-led Railway Ministry to send a team of Mithila artists so that the same can be implemented there as well, the report said. 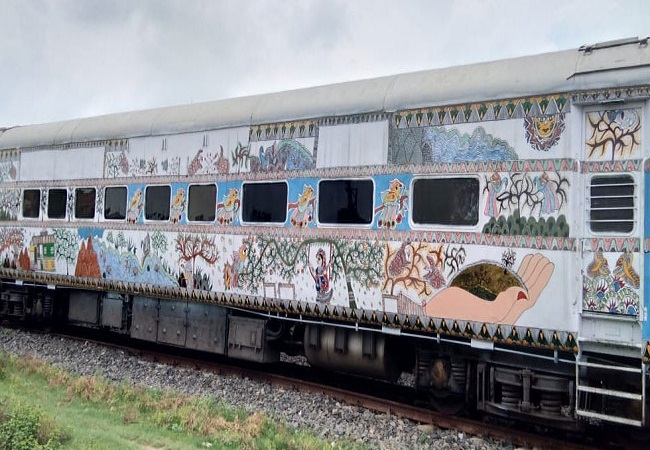 A railway ministry official told Financial Express Online that a team of Madhubani artists may be sent to Japan. Last year in the month of August, Indian Railways painted the coaches of Bihar SamparkKranti Express with traditional Mithila art work. The superfast train runs between Darbhanga in Bihar and Delhi. Apart from superfast Bihar SamparkKranti Express, two other trains namely Rajdhani Express and Jansadharan Express were also decorated with similar design patterns. As many as 22 coaches of the Patna Rajdhani Express train, inside as well as outside were decorated with beautiful Mithila paintings. 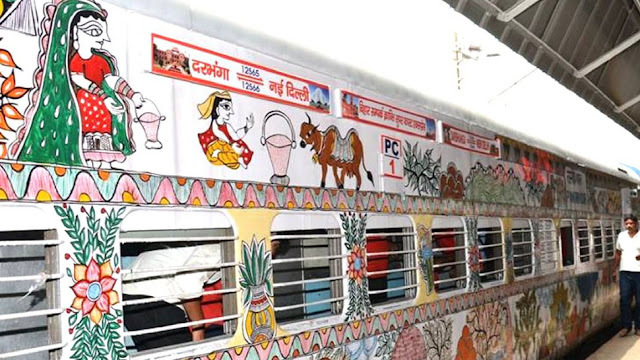 The idea to decorate Indian Railways’ trains with the traditional Mithila art form started from Madhubani railway station in Bihar.It was reported that the trend, which was widely appreciated was soon followed by other railway stations of Bihar like Patna Junction, Rajendra Nagar station and Danapur station. 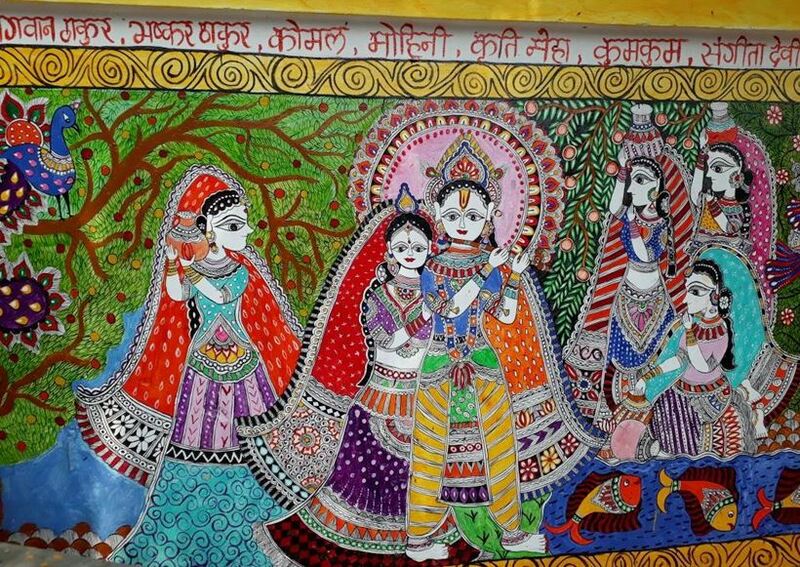 The station decoration initiative was launched at Madhubani railway station as a part of the beautification and cleanliness project of Indian Railways which also highlighted the skill of local Mithila artists. Last year, the Madhubani railway station in Bihar also won an award in a station beautification competition, which was organized at Rail Bhavan. 13021 / 13022 ‘Mithila Express’ runs between Howrah Junction - Raxaul railway station. 2. photo from various web sources /news dailies.